The Alumni Section in the Department of Student Affairs at Dhofar University is working toward a future where Dhofar University alumni take pride in their University experience and pass that enthusiasm on to their children, prospective students and others. The purpose and function of Alumni Section is to foster cooperative support for the University among all alumni groups so that the synergy of these combined efforts assures Dhofar University of unfailing alumni support and the means by which to take its place among universities in Oman and the world. It is hoped that in the future, Dhofar University alumni will become prominent stakeholders, participating in key decisions at the very top levels of the University. Dhofar University Alumni Section seeks to maintain a mutually beneficial, lifelong connection between DU and its alumni, parents and friends. By staying connected, the University can continue to offer its academic services and quality experience in updating its alumni on its latest news. Alumni shall provide input towards guiding DU to become a top University for future generations. Provide alumni with opportunities to relate with one another, to participate in continuing education programs, seminars and University activities. Serve as a bridge between the University and the alumni in their professional careers. Promote the contribution of alumni as ambassadors of Dhofar University and as active partners in attracting future students. Inform and update alumni on the latest news about their University through various means of communication. Involve alumni in contributing to scholarship programs at DU. Graduates Department at Student Affairs Department, Dhofar university, has organized a gathering for 2017 graduates from different departments who are working in various jobs after graduation. The gathering aimed to support the continuous communication between the university and its graduates as DU is the main supporter for accomplishments of graduates in different work fields and experiences that they have achieve after what they have learned during their study years. Mayssa Bahjaj, graduate from DU, talked about skills that students gain in their studying years in the university aside with knowledge. Later on, Khalid Ahmed Bait Said, graduate from college of Arts and Applied science, spoke about labor market challenges that face graduates and how to defeat them with insistence and courage. 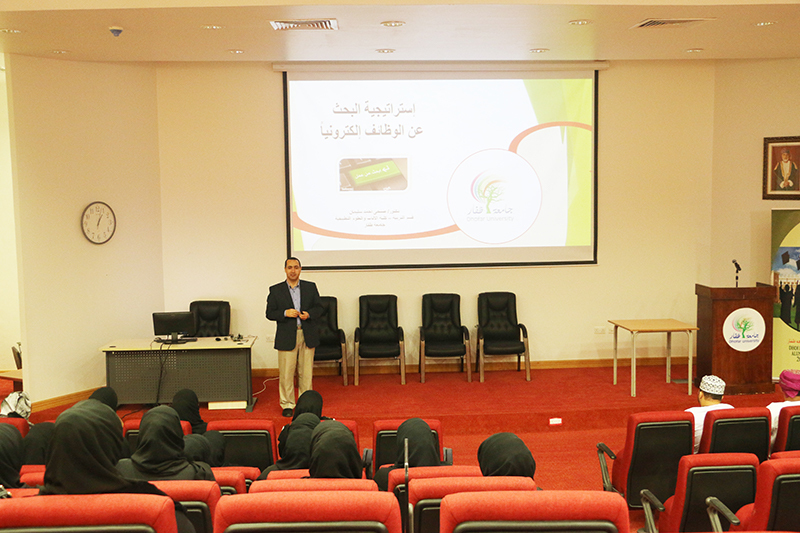 Moreover, Sobhi sulaiman, lecturer in education department in college of Arts and Applied Science, gave a workshop on how a graduate can accomplish skills and experiences to help them find a job and prepare for it and how to write a good CV then search for jobs online.